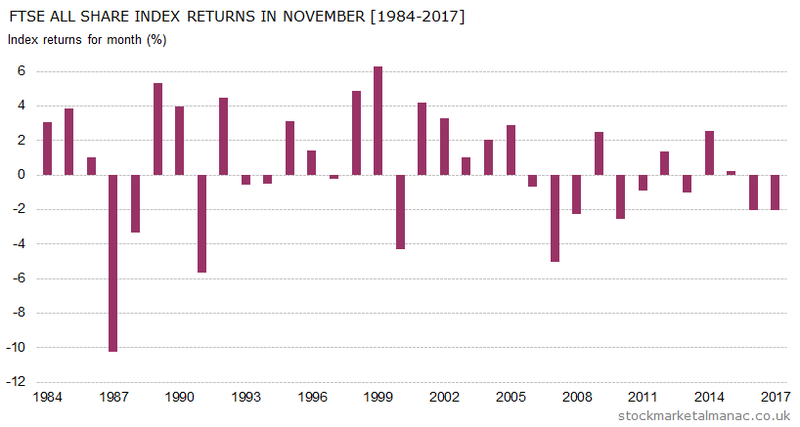 Since 1990 the FTSE All-Share Index has seen an average return of 0.6% in the month of November; with positive returns in 15 of the last 28 years. This ranks November in the middle of the 12 months for equity performance. 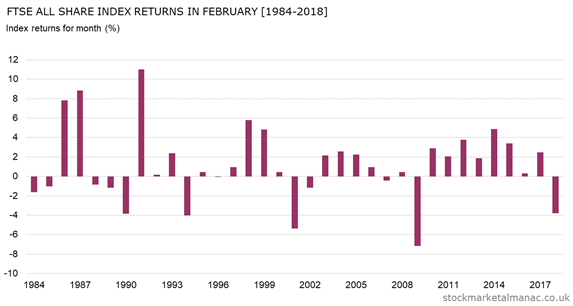 However, in recent years the market has been noticeably weak in November ­in the last 12 years the Index has only seen positive returns in the month in four years. 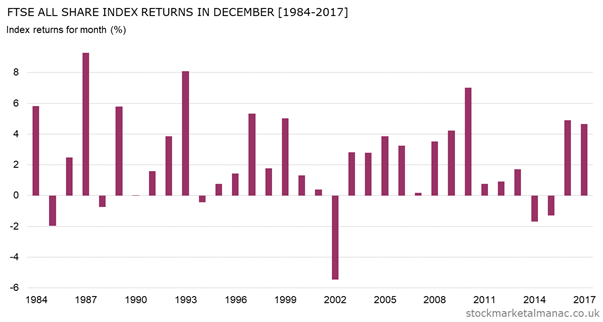 A feature of November in recent years has been its low volatility, since year 2000 the volatility of shares in November has been the lowest of any month in the year. In an average November, the market rises in the first three days, but those gains are then given up in the following few days. In the middle of the month prices increase and then fall back again, before finally rising strongly in the last seven days of the month. In the last ten years the FTSE 350 sectors that have performed strongly in November have been: Food Producers, Aerospace & Defense, and Media. While the weak sectors have been: Oil Equipment, Services & Distribution, Real Estate Investment Trusts, and Industrial Transportation. At the company level, FTSE 350 shares that have tended to be strong in November over the past ten years have been: CRH [CRH], Shire [SHP], Britvic [BVIC], Babcock International Group [BAB], and Compass Group [CPG]. FTSE 350 shares that been weak are: Galliford Try [GFRD], Royal Bank of Scotland Group [RBS], Ashmore Group [ASHM], Hochschild Mining [HOC], and Petrofac Ltd [PFC]. Elsewhere, November has tended to be a strong month for gold and weak for the pound against the dollar. This is a busy month for interim results: 64 companies from the FTSE 350 make their announcements in November. Dates to watch out for this month are: 2nd – US Nonfarm payroll report, 7th – two-day FOMC meeting starts, 8th – MPC interest rate announcement and inflation report, 13th – MSCI semi-annual index review, and the 23rd – NYSE closed. September is often not a good month for the stock market. 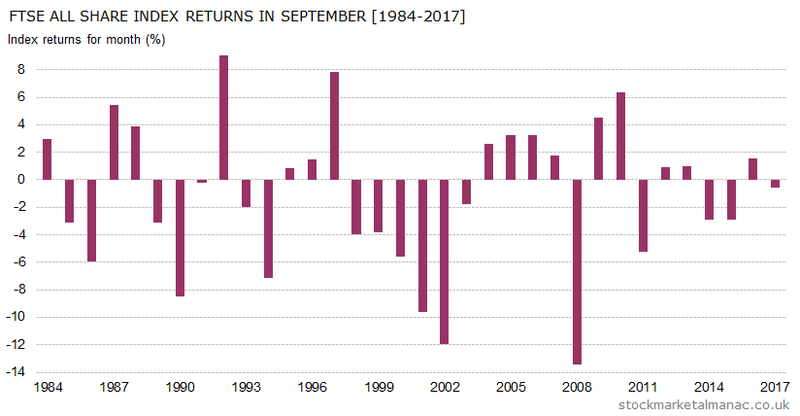 Since 1990 the average return of the FTSE All-Share Index in September has been -1.2%. For some time this record made September the worst month of the year for shares, but this year June has claimed the crown of worst month and September becomes just second-worst. 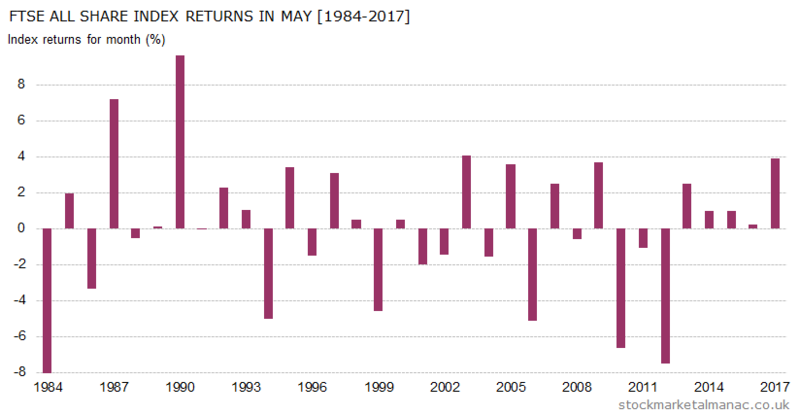 Since year 2000, the Index performance in September has been even worse, with an average return of -1.6% in the month. 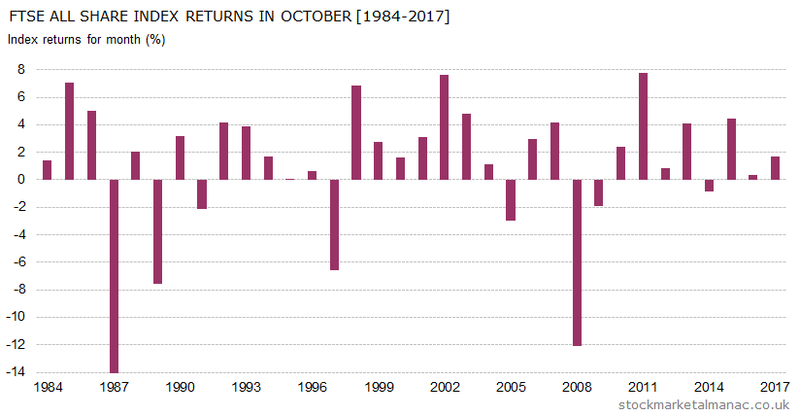 However, although the average return is bad in the month, over the longer-term about half of all Septembers actually have positive returns. The situation is even worse for mid-cap stocks. Since 2000, on average the FTSE 250 Index under-performs the FTSE 100 Index by 1.4 percentage points in September. 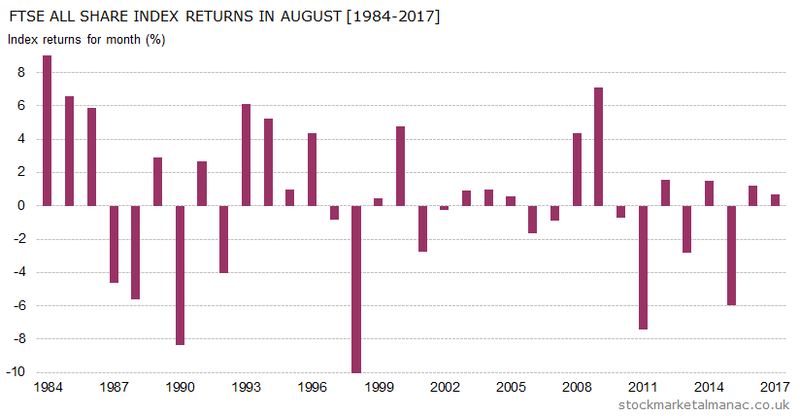 In contrast to equities, gold tends to be strong in September: since 1968 the average gold price return in the month has been 1.8%, making September the second strongest month of the year for gold after February. On the sector front, September tends to be good for Tobacco, Nonlife Insurance, and Beverages, and relatively bad for Industrial Transportation, Real Estate Investment Trusts, Electronic & Electrical Equipment. FTSE 350 shares that have been relatively strong in September over the last ten years are: JD Sports Fashion [JD. ], SuperGroup [SGP], Genus [GNS], Jupiter Fund Management [JUP], and Dechra Pharmaceuticals [DPH]; while share that have been in the month are: Standard Chartered [STAN], BT Group [BT.A], Man Group [EMG], Rio Tinto [RIO], and William Hill [WMH]. 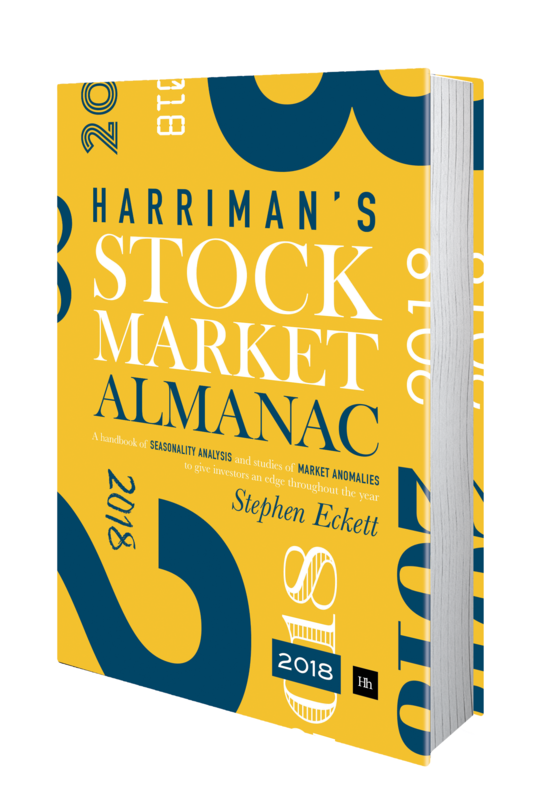 In the diary this month are: the NYSE is closed on the 3rd (Labor Day), the FTSE quarterly index reviews will be announced on the 5th, and the US Nonfarm payroll report is on the 7th. 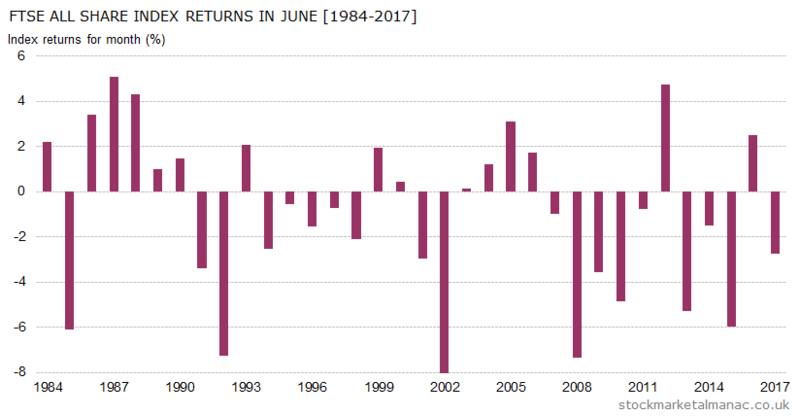 Since 1970 the FTSE All-Share Index has seen an average return of 0.8% in July, with 54% of years seeing positive returns in this month. 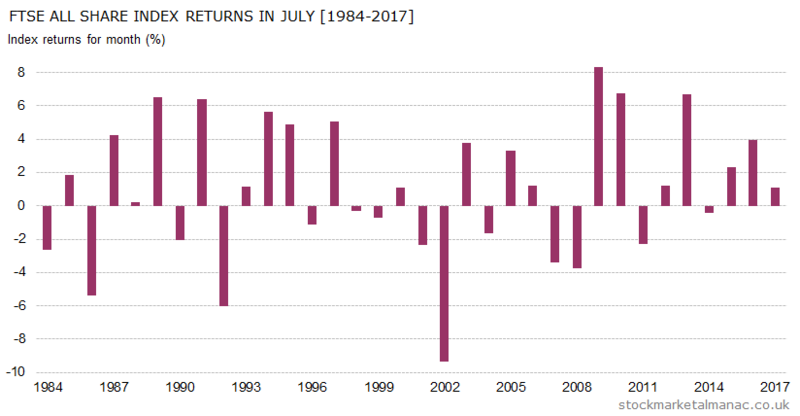 This makes July the fifth strongest month of the year for shares. As can be seen in the accompanying chart, in the last nine years the market has only fallen twice in July; so currently July is on a roll. 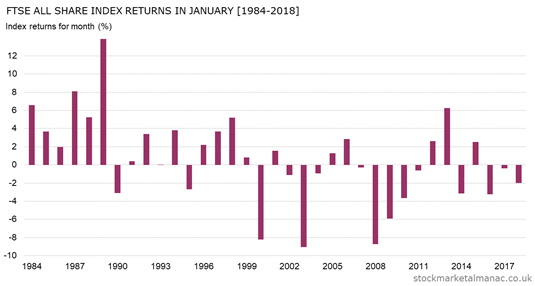 July is one of only three months (the others being September and October) where the FTSE 100 tends to out-perform the mid-cap FTSE 250, although the out-performance in July is not significantly large (an average of 0.1 percentage points since 1986). Better is the performance of the FTSE 100 relative to the S&P 500, in sterling terms July is the second-best month for the FTSE 100 (the UK index has out-performed the US index by an average of 1.0 percentage points since 1984). Historically the sectors that have been strong in July are Banks, Real Estate Investment Trusts, and Software & Computer Services, while weak sectors have been Electricity, Industrial Transportation, and Health Care Equipment & Services. On the shares front, companies that have seen strong share performance in July have been: Travis Perkins [TPK], Renishaw [RSW], Morgan Advanced Materials [MGAM], Bodycote [BOY], and Elementis [ELM]. The latter’s shares have only fallen once in July in the past ten years. Companies that have historically performed weakly in July are: TalkTalk Telecom Group [TALK], SSE [SSE], CRH [CRH], Redefine International [RDI], Babcock International Group [BAB]. Shares of SSE have fallen every year in July except one in the past ten years ­ the worst record of any FTSE 350 stock. On the economics front: there is the US Nonfarm payroll report on the 6th, and the two-day FOMC meeting starts on the 31st. The New York Stock Exchange will be closed on 4th July.